This list is from the Sa.myutta Nikaaya, Mahavagga, SN.V.55.8. possess the virtues (Siila) dear to the noble ones, unbroken, untorn, unblemished, unmottled, freeing, praised by the wise, ungrasped, leading to concentration. This list is from the Sa.myutta Nikaaya, Mahavagga, SN.V.55.5. The following list of ten bases for meritorious deeds (pu~n~nakiriyavathu) shows ten ways to develop wholesome kamma for the sense sphere (kammavacarakuala.m). I strongly recommend everyone memorise this list and make strenuous efforts to put the list into practice. This will be for your benefit now and for a long time into the future. I copied/paraphrased these nine ways from two different English language translations of Ven. Sayadaw U Kundala’s Burmese language transcriptions of Dhamma talks. I’m sorry I don’t have the citation details since I left the books in Yangon. These nine ways are also in the Visuddhimagga (The Path of Purification) by Ven. Buddhaghosa, in the section on Samaadhi. Buddhaghosa appears to have provided them to strengthen the five controlling faculties (panc’indriya) and develop samatha – one pointedness of mind. Ven. Mahasi Sayadaw and the Mahasi tradition of vipassana meditation have adapted these nine ways for vipassana meditation. 1. Direct the mind on the nature of cessation of phenomenon; incline the mind towards the dissolution or passing away of the observing and noting object. 2. Note respectfully and penetratively; note respectfully, closely and intensely to actually see the dissolution. 3. Note continuously without disruption in noting; note incessantly without break or gap so the noting will be continuous throughout. alms – convenient to obtain food, not having to walk far etc. climate – not too hot, not too cold etc. 5. Note the causes of development of vipassana samaadhi (insight concentration), remember the causes for attaining the tranquillity of mind, the causes of samaadhi, the signs (nimitta) of past samaadhi. 7. Be detached from body and life [be ready to sacrifice the bodily comfort for progress in Dhamma]. 8. Practice to overwhelm all painful sensations/feelings [not by force of will but by patient noting and perseverence]. 9. Make a determination/resolution for non-stop continuous noting until reaching perfection, don’t give up observing and noting until reaching path and fruition (magga and phala) [this is for an advanced stage and usually after being instructed to do so by the teacher]. Sayadaw U Jatila is a brother of Sayadaw U Lakkhana who is also a leading vipassana meditation teacher in the tradition of Mahasi Sayadaw. Both teachers have travelled and taught overseas, though both relied heavily on translators. Sayadaw U Jatila teaches at MSY for about six months every year from about June to November and spends the other six months at his base monastery near to Naypidaw. 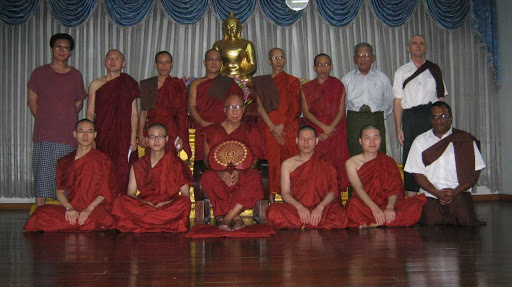 About three days after I arrived at MSY four Chinese Mahayana monks came from Singapore where they are studying. They all spoke Mandarin well and English poorly. I speak English well and Mandarin poorly. Even so, Sayadaw U Jatila asked me to help with translating during meditation instructions, interviews twice a week and once a week for the Dhamma talks. I struggled because I hadn’t learned Dhamma technical terms for Mandarin and neither were the monks familiar with Paali terms used by most Theravada Buddhists, though they knew most of the similar concepts in Mahayana Buddhism using Mandarin. We managed and taught each other a lot. They wanted to ordain temporarily as Theravada monks so I seized the opportunity to make merit and sponsored their ordinations. It was very interesting and we all learned a lot. The Korean Monk and Korean Yogi appeared unable to speak any other languages except Korean and a few words of English so they didn’t talk with anyone except each other. I first met the Thai monk – Ajahn Sujin Decharo at Chanmyay Yeithka two and a half years ago and was able to have many fascinating conversations with him in Thai. He has been in Myanmar for nearly 5 years and recently spent 7 monks at Pa Auk Tawya. Ajahn Sujin speaks only very basic English so I also helped translate for two of his meditation interviews with Sayadaw U Jatila because the visiting Laos monk (a student at the International Theravada Buddhist Missionary University) was not available to translate at those times. Note: Talking is not really a good practice at meditation centres. Usually it is better to practice “noble silence” to get maximum value from the time there and make the quickest progress. Even so, I learned a lot during the three weeks I spent at MSY.